357 W.C.T.U. met nov 15 with Mrs Eva Pepoon with 13 members present. Minutes of Sept and Oct meetings were read and approved. Treasurers report given Mrs Pepoon reported for the Legislative committee Bernard cresivell presented a Total abstinence Health plan on Hospital Insurance for non drinking drivers, of which he is an agent. 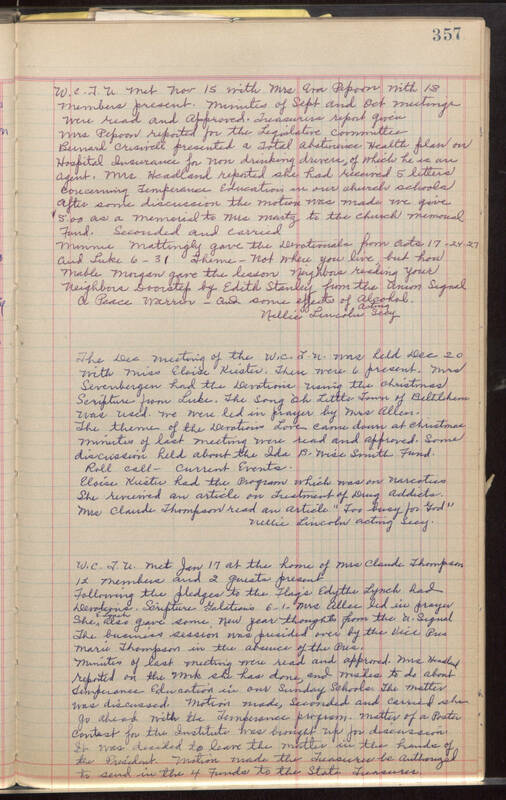 Mrs Headland reported she had received 5 letters concerning Temperance Education in our church schools after some discussion the motion was made we give $5.00 as a memorial to Mrs Martz to the church memorial Fund. Seconded and carried. Minnie Mattingly gave the Devotionals from Acts 17-24-27 and Luke 6-31 Theme - Not where you live, but how Mable Morgan gave the lesson Neighbors reading your Neighbors Doorstep by Edith Stanley from the Union Signal A Peace Warrior - and some effects of alcohol. Nellie Lincoln acting secy. The Dec meeting of the W.C.T.U. was held Dec 20 with miss Eloise Kiester. There were 6 present. Mrs Sevenbergen had the Devotion using the christmas Scripture from Luke. The song 'Oh Little Town of Bethlehem was used. we were led in prayer by Mrs Allen. The theme of the Devotions Love came down at christmas minutes of last meeting were read and approved. Some discussion held about the Ida B. Wise Smith Fund. Roll call - current Events. Eloise Kiester had the Program which was on narcotics She received an article on Treatment of Drug Addicts. Mrs Claude Thompson read an article "Too busy for God" Nellie Lincoln acting Secy. W.C.T.U. met Jan 17 at the home of Mrs Claude Thompson 12 Members and 2 guests present Following the pledges to the Flag's Edythe Lynch had Devotions Scripture Galatians 6-1- Mrs Aller led in prayer She E. Lynch also gave some New Year thoughts from the U. Signal The business session was presided over by the Vice Pres Marie Thompson in the absence of the Pres. Minutes of the last meeting were read and approved. Mrs Headland reported on the work she has done, and wishes to do about Temperance Education in our Sunday Schools. The matter was discussed. Motion made, seconded and carried she go ahead with the Temperance program. matter of a Poster contest for the Institute was brought up for discussion. It was decided to leave the matter in the hands of the President. Motion made the Treasurer be authorized to send in the 4 Funds to the State Treasurer.